Do I Get A Stuffed Bear When I Hit 100? Back on April 28th I had a blog posted titled, “All 254 Of You Can F Off.” It outlined my philosophy of saying yes to anyone. Who knows what you will find. A philosophy not shared with others, well at least not with 254 males between the ages of 25-45 in the Los Angeles area. 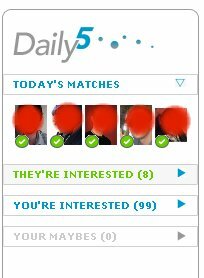 On Match.com they have a “Daily 5.” They choose 5 guys daily they feel you would like. I’ve discussed their lack of a scientific formula before. I’m pretty confident it includes a dartboard and some thumbnail pictures of everyone. I decided to throw caution to the wind and just “okay” everyone on today’s list without looking at them. Why not? They aren’t going to respond anyway. Honestly take a look at those stats. My “You’re Interested” number is 99 (add that to the 254 Chemistry and that number goes from pathetic to just plan ol’ sad). Soooo close to 100 …. sooo close … just one more …. Of those 99 that I’ve “shown interest in”, meaning they get an email that says “hey Wendy is interest in you (picture included)” only 1. ONE has responded. ONE. ONE OUT OF 99. BTW that was the guy in alien territory that I wrote about yesterday. ONE POSSIBLE ALIEN DUDE OUT OF 99. And if you are wondering about those 8 chaps interested in me. Based on the pictures (although not all 8 have pictures) and profiles I’m pretty confident that it is actually just part of the US top 10 wanted list. Tomorrow I’ll hit 100. I demand Match.com send me a stuffed bear for me efforts. You should'nt be eating anything while reading this blog — you might choke! I laughed so hard I almost gagged on my mouth full of ice cream!